Play it safe this Halloween with non-toxic face paint pencils. Tests show that many face paints contain lead and other heavy metals. Lead acts as a neurotoxin and heavy metals like nickel, cobalt and chromium can cause skin sensitization and contact dermatitis. Enter our Halloween Giveaway and you could be dressing your kids up without the nasty chemicals - for free! 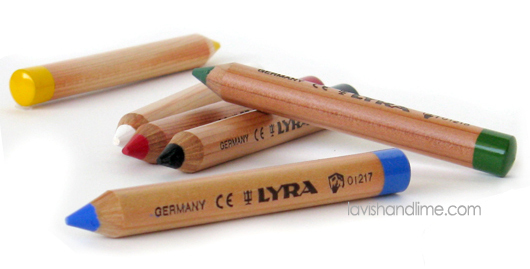 We're giving away a six-pack of non-toxic Lyra face paint pencils made in Germany. These top quality wood-encased pencils require no water, have undergone rigorous safety testing and are both lead-free and paraben-free. Simply answer the question below and you'll be entered to win - good luck! Answer the following question and a pack of Lyra non-toxic face paint pencils could be yours! What is your favourite homemade costume of all time? You could have worn it, you could have seen it, you could have/will be dressing your kids in it this year! Leave your answer in a comment below, email it to us at customerservice@lavishandlime.com with 'Halloween Giveaway' in the subject line or feel free to drop it by our warehouse shop Mon-Fri, 9am-5:30pm: 272 East 1st Street, North Vancouver V7L 1B3. Please be sure to include your name, email address and telephone number so we can contact you if you win. Do any of the following and be sure to tell us you did! 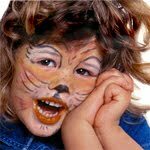 "I just entered to win a pack of non-toxic face paint pencils at Lavish & Lime - check it out for yourself here: www.lavishandlime.com"
One entry per person. The winner will be chosen in a random draw by Lavish & Lime. Deadline for entries is noon PST Monday, October 24th. The winner will be notified by the end of Monday, October 24th. Open to Canadian residents only. My favorite costume was from a group theme friends and I did several years ago - the Smurfs! We had papa smurf, Gargamel, Smurfette (Me!) and various others! We were Laura and Mary Ingalls from Little House on the Prairie! The shower scene from The Birds. My friend used a rolling metal frame with a curtain that she stood inside of. She dressed in a towel and shower cap, and had a black cutout of a knife attached to the curtain. I was just looking through the dollar store make up, refusing to buy it because of what is probably in it!! I would love to win these face pencils :-) Thanks for the opportunity on your facebook page!! My favorite homemade halloween costume of all time was the beast from Beauty and the Beast. I was in my late teens and my mom was looking for ideas for Disney couples' costumes for friends. I suggested Beauty and the Beast and when she said it couldn't be done I took that as a challenge. I ended up going to a Halloween party dressed as the Beast complete with furry feet and giant paper-mache head and was the only one in costume :) I still have my beast head. I am a fan on Facebook and commented on your wall. My fave costume was one that I sewed for myself in grade 9 home-ec class. It was a big cow suit and we hund bottles of lea and parrin steak sauce around our necks (my friend and I) and we went as the Lea and Parrin steak sauce cows. Moo moo moo moo! I've left you guys some facebook love for an extra entry. My favorite homemade costume was one I made last year for my then 1 year old. I made him a star trek costume from scratch including a lovingly and painstakingly cut star trek badge made from paper and bike reflector stickers. I was really proud of the results and it was sun to have people recognize who he was! My favourite costumes this year are the angry bird costumes! Already like you on facebook!! My favourite costume is one that all 4 of my kids have worn for their first costume. They wear back pants and turtle neck. We have a spider eyes hat and I made 4 "extra" legs so that they have 8 "legs" in total. the extra legs are long pipe cleaners with pompom ends and fit on with black elastic like a little backpack. It works so well for crawling babies. when we were little my sisters and i dressed up as santa and elves. We were asked if we were aware if we were early for our holiday! Friends of mine dressed up as tinkerbell and peter pan one yet.. the costumes were homemade and they were great! I receive your monthly newsletter. My daughter LOVES pigs, has since she was a toddler so when she was three I made her a pig suit - now you can not just go and get a pig pattern so I found a nice fat pumpkin pattern and got pink matterial, made a tail nice and curly of course and then with the hat I made ears instead of the top it had - it was perfect .She is almost 7 (and is tiny) and still wears it every halloween - and the best part, she also wears it at our Unitarian Christmas pagent each Christmas as well -not to mention at all other times of the year! This is the best worn costum ever LOL. Good thing I double sticked those seems!! My favourite costumes are ones my sister has made for her son. One year he was a bathtub~ made from a laundry basket and balloons and another year, a washing machine! So fun :)Thanks for the chance! I made a fairy princess outfit for my daughter. She was satin and glitter and amazing. My favourtie costume was one I made for my daughter when she was 4. She went to school as Wall-E. Pretty simple really, spray painted a box yellow and cut holes for her arms and head. Glued together some recycled cereal boxes for the eyes, and hand/arms and tacked them to a pair of gloves and hat. She loved it! I think my son will use it again this year! My favourite costume was when I went as Arwin from lord of the rings. Ears and all... my husband was a ring wraith and when we saw pictures of us dancing together we looked hilarious! I saw someone in an Optimus Prime costume! One of the favourites was the Vampire for my oldest son Steven. He was in grade 3, I made the vest tie pants and the huge black cape with the red lining. That cape was played with for years and is still here. Steven is now 27 and the kids still talk about playing with it and the other that I made over the years. My favourite costume is a tie between when I was a vegetarian vampire, all in tie-dye, who sucked the juice from fruit and vegetables and a poeTree with a corrugated cardboard trunk and my arms stuck out through holes like branches and covered in poetry terms written on leaves. Paper Bag princess. Just use one of the old giant paper bags from recycling. My favourite costume of all time was from my husband's childhood pictures. His dad helped him make a robot costume from an old computer, box, duct tape and dryer host and of course tinfoil. my favorite costume is one i made for my son last year: the music man! My boys were curious george & a banana and daddy was the man in the yellow hat! Paper Bag Princes made out of a yard leaf waste bag!